It's a Gas: Parody and protest have combined in the newly flush world of political card decks. Political card decks are suddenly all the rage, but when Phil and Arlene Dunkelbarger put together their "WMD Regime Change" deck--a left-wing parody of the U.S. military's infamous Iraq deck that features President Bush and Vice President Cheney rather than Saddam on the ace of spades--they wanted to make sure they did it right. Determined to get permission for the images they used, instead of just downloading them off the Internet like the creators of many decks have done, they called up the Associated Press. But before AP would sell the Dunkelbargers the rights to their images, they insisted on knowing how the pictures would be used. "And when they found out," says Phil Dunkelbarger, "they said no, they didn't think they could participate, because they have to interview people and were afraid of retaliation and not getting access to people in the future." The result? Associated Press itself ended up on the Dunkelbarger's queen of diamonds, in a list of "In-Bed" media outlets that also includes Fox News and CNN. "There's no possibility of the press being independent if they have to put out a message that's salutary to the administration," says Dunkelbarger by way of explanation. All this began in reaction to "Iraq's Most Wanted," the deck of cards the U.S. military released during Operation Iraqi Freedom that depicted 55 of the most-wanted senior Iraqi government officials. Now, decks representing an alternative point of view are suddenly hot sellers. Just in time for the holidays--oh, and the 2004 presidential election, too, of course. 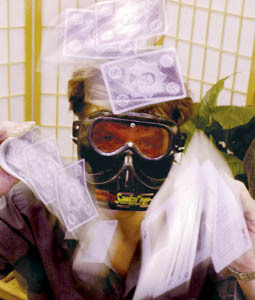 Los Gatos schoolteacher Kathy Eder trailblazed the parody path with her "Operation Hidden Agenda" cards, which depicted President Bush and members of his administration in what might be called an unflattering light. Each card has a damning nugget of information, mined from websites, magazines and books by Eder, who is donating half of all her profits from sales of the cards--more than $20,000 to date--to peace and veterans organizations. In the beginning, though, not everyone was receptive to the idea. Eder says retailers were initally afraid of controversy over the cards. "I was being turned down all over Silicon Valley," she says. Bookshop Santa Cruz was the first store that agreed to carry the cards, and now reports selling over 2,500 of the decks to date. After the brisk initial sales, the cards and Eder became very well known very quickly. Future card targets AP and CNN reported the story, and newspapers from Botswana to Bangladesh picked it up, with all the media exposure culminating in a tussle between Eder and Bill O'Reilly on The O'Reilly Factor. Eder says she got the idea for the cards when the kids in her high school ethics class were all in favor of the war, but could not provide her with any factual basis for their positions. She says she felt an obligation "to get the truth out there." Not everyone, of course, agrees on that definition. Eder has received a good deal of hate mail, and she says she replies to every note "with peace, following the teachings of Gandhi"--yielding, in some cases, apologetic replies and continued correspondence with former hate-mailers. The central purpose of the cards is exposing what Eder sees as Bush administration hypocrisy. The ace of clubs, for instance, uses an image of Donald Rumsfeld shaking hands with Saddam Hussein in 1983, when he was Reagan's envoy promoting a U.S.-sponsored oil pipeline. The picture was taken the very same day the U.S. learned that Iraq was using chemical weapons in its war with Iran. A year and a half after her deck came out, Eder says much of the truth about the U.S. involvement in Iraq was in the cards. "Unfortunately, many of the deceptions that the cards suggested have been proven right--the faked intelligence, the WMDs that can't be found, the yellow-cake uranium that wasn't there," she says. "But I'm always hopeful for the future. Right now, the decks are selling best in Washington, D.C. My hope is this means Bush is buying them as stocking stuffers." As for how the cards were made, Eder says she got all the images from the Department of Defense, free for the asking. "Unfortunately," she notes wryly, "the Department of Defense has a way of giving you more than you want." Since Eder released her deck, several enterprising card sharks have come up with versions of their own, each with a slightly different angle. Just organizing the Dunkelbarger's "WMD Regime Change" cards into suits is a fascinating exercise in itself. Ace of Hearts Ronald Reagan, described as "Father Neo-Con" and "Progenitor of Voodoo Economics," keeps company with Sen. Joe McCarthy, John Ashcroft, Katherine Harris, William Rehnquist and the NRA, not to mention Justices Antonin Scalia, Clarence Thomas, Sandra O'Connor and Anthony Kennedy, who are depicted as "key figures in the 2000 coup d'état." Unique to the WMD deck is the placement of Oliver North and Osama bin Laden on the same card, namely, the Jack of Spades, a move that also places both characters squarely in the same suit as Bush, Cheney and Karl Rove. "Both North and bin Laden were alleged money launderers, drug dealers and terrorist ringleaders, responsible for thousands of innocents' deaths," says Dunkelbarger. He and his wife are creating online links for each individual and issue featured in WMD at www.regimechangecards.net, in recognition of the fact that there's way more to be said than the sound bites that fit on the cards. The website allows for a handy updating of facts and figures like those included on the pack's three of diamonds, which compares figures for the federal budget, the national debt and the unemployed to those from three years ago. "As Reagan would ask, 'Are you better off today than you were three years ago?' By that token, if you use that same yardstick, Bush wouldn't see another term," says Dunkelbarger. While the Regime Change cards may take the prize for sheer amount of information delivered, Bush Cards have the distinction of being brought to us by the tastefully named Project Pretzel, which, as creator/publisher Zach Levy explains, "was a code, because the last thing we needed when designing Bush Cards was a 100 copycats. Unique to Bush Cards is the fact they feature 52 different people, emphasizing the deck's satirical precision strike on the "Iraq's Most Wanted" concept. "We tried to walk a fine line between funny and sad, so your first response is to laugh, then scratch your head and ask, 'Is this really my government?'" says Levy. "We wanted to appeal to a large audience, not just preach to the converted, which is a shortcoming of the left." Told that our personal favorite Bush Card depicts the commander-in-chief as the Joker, dressed in military duds, Levy laughs. "When that [event] happened, the news commentators were all, 'Well, now he's untouchable!' and the Dems were all afraid he'd use it in a campaign commercial," says Levy. Whereas I thought, 'This is ripe for parody.' This is how we define leadership? Put on a flight suit and land on an aircraft carrier?" So what is Levy's ultimate objective, besides regime change? "Hopefully," he says, "you'll laugh some, learn some--and we'll win a few converts." Maybe he is. The cards are now in over 200 stores in 30 countries. And yet, perhaps not surprisingly, California remains the epicenter of sales. But Levy's not so sure that's a political statement from the Golden State. 'Maybe," he says, "it's because Californians like to play cards." Asher Brauner contributed to this story. Bush Cards are available locally at Capitola Book Cafe and UCSC's Bay Tree Books. Operation Hidden Agenda and Wmd Regime Change cards are available at Bookshop Santa Cruz.